German children today know the expression Das macht nach Adam Riese... (that gives according to Adam Ries) when doing arithmetic. From the list of references attached to this article, which is only a small selection of the vast amount of material concerning Ries, it will be seen that there remains a very considerable level of interest in this mathematician. Adam Ries's name appears with a number of different spellings, a common phenomenon with people living around this time who were certainly not consistent with their own spelling of their names. Ries himself used the forms Ries and Risz when he signed documents, but other forms of his name such as Riese (used by his father), Ris and Ryse are also found. His mother, Eva Kittler, was the second wife of his father Contz Ries (born 1478 in Staffelstein, died 1506 in Staffelstein) who owned a mill in Staffelstein as well as several houses and a vineyard. Certainly Contz Ries was well-off. After the death of his first wife Anna, with whom he had several children, he married again in 1492. Adam was the first child of this second marriage to Eva, having younger siblings Katarina, Margareta and Conradus. He became known as "the greatest son of Staffelstein". ... to draw attention to the fact that Adam Ries [before becoming a 'Rechenmeister'] busied himself with then current mathematical problems and in doing so occupied a position equal to that of his contemporary Cossists. There is documentary evidence that on 22 April 1517 he was back in Staffelstein, for on this day he appeared before the Council of Staffelstein trying to settle a dispute over inheritance. In 1518 he moved to Erfurt where he ran a school as 'Rechenmeister' (master of calculations) and 'Hofarithmeticus' and, although he did not attend university there, he had many contacts with academics from the university and he profited greatly from these contacts. Perhaps the most important friendship was with Georg Sturtz (1490-1548) who was an academic at the University of Erfurt. Sturtz's home was a famous meeting place of the Humanists and Ries made many useful contacts there. In fact it was Sturtz who gave Ries a collection of manuscripts on algebra and arithmetic which had been given to him by Johannes Widman. 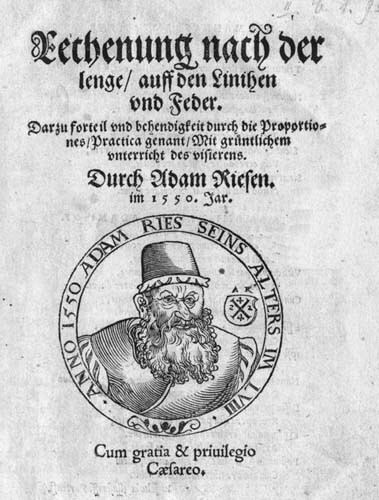 Ries wrote his first two books while in Erfurt: these are Rechnung auff der linihen Ⓣ (1518) and Rechnung auff der linihen und Federn Ⓣ (1522). We give some details of these works below. In 1523 Ries became 'Bergbeamter' (engineer and inspector of mines) in Annaberg, which is a centre for the silver-mining region of Saxonia, and he also taught mathematics there. He had already been working on a manuscript for an algebra book, Coss, and it was after settling in Annaberg that he completed the text. We look at details of this work below and also how it became to be published in recent times. After settling in Annaberg, he got to know Anna Leuber (1495-1545), from Freiberg, who was the daughter of the master fitter Andreas Leuber and his wife Margaret Birner. Adam and Anna were married in 1525 in Saint Anne's Church, Annaberg (at this time a Catholic church, but it became a Lutheran church in 1539). In the same year of 1525, Ries took the necessary oath to become a citizen of the city. He bought a house in Johannisgasse and there Adam and Anna Ries brought up their eight children, five sons and three daughters. Three of the sons, Adam, Abraham and Jacob, became mathematicians working in Annaberg, while Isaac, one of other two sons, became a 'Visierer' (weights and measures master) in Leipzig. The fifth son, Paul, moved to Wiesa, close to Annaberg, where he became a judge and was an important landowner. Returning to the year 1525, this was when Ries became 'Rezessschreiber' (recorder of mining production) in Annaberg, then in 1532 'Gegenschreiber' (bookkeeper recording of ownership of mining shares) and, from 1533 to 1539, 'Zehnter auf dem Geyer' (financial administrator for mining in the district). The year 1539 marked a substantial change for Annaberg which we hinted at above when we noted that the church in which Ries married changed from Catholic to Lutheran in 1539. This change resulted when the Catholic ruler of the town, Duke Georg, was replaced by his Lutheran brother Heinrich in that year. Ries's name appears in lists of Lutherans living in Annaberg made in 1530 so the arrival of the Reformation in Annaberg in 1539 must have helped Ries's career. That this happened is clear from the fact that, in 1539, Ries became court mathematician and was given the title Churfürstlich Sächsicher Hofarithmeticus. At this time he purchased the Riesenburg, a small castle, outside Annaberg almost half-way between Annaberg and Wiesa. The Riesenburg still exists today close to the Wohngebiet Adam Ries. No copy of the first edition of this book has survived, the earliest that we have is the second of the four editions which was published in 1525. Ries states clearly in this second edition that the book is intended for children and he must have written it to aid his school teaching at this time. A third edition was published in 1527. The second of Ries's books written while he was in Erfurt was Rechnung auff der linihen und Federn Ⓣ (1522). This book ran to over 100 editions, which is a remarkable achievement. It was aimed at apprentice craftsmen, not at schoolchildren, and in addition to explaining the use of the lined calculating board, this book described calculating with Indo-Arabic numerals. A wood-cut illustrates the purpose of the book by showing two people calculating with the rival methods, one using the calculating board, the other using Indo-Arabic numerals. Clearly Ries taught both the old method of calculating, derived from the abacus, and the new method, derived from the Indians, which at that time was forbidden in most countries! The third of Ries's arithmetic books Rechenung nach der lenge, auff den Linihen vnd Feder Ⓣ is often known as the Practica; it contains the picture of Ries which is reproduced above (the only image from a contemporary source). The book appeared in 1550, printed in Leipzig by Jakob Bärwald, and was a textbook written for everyone, not just for scientists and engineers. The book explains addition, subtraction, multiplication and, very surprisingly for that period, also division. At that time division could only be learnt at the University of Altdorf (near Nürnberg) and even most scientists did not know how to divide; so it is astonishing that Ries explained it in a textbook designed for everyone to use. The reason for the long delay between the appearance of Ries's first two arithmetic texts and this third one was not because this third arithmetic was a much later work. Indeed most of the material had been written by Ries by 1525 but the printing costs were very high and he did not have the necessary funds to pay a printer. However, eventually the Elector Maurice of Saxony agreed to advance him enough to pay the printing costs and publication could proceed. ... so that the poor common man will not be cheated when buying bread. In addition to his famous arithmetic primers Adam Ries has also written an extensive algebra book: The Coss. The symbol for the unknown, or variable, was called coss in the middle ages. Adam Ries also called it radix, root or thing. Ries's Coss, which, contrary to contemporary custom, was not written in Latin, but in German, is a link between the medieval descriptive algebra and the analytical algebra of modern days. Ries's fame was considerable and much has been done over the years to honour him and keep his name to the fore. A bronze statue which was erected in Annaberg in 1893 was later melted down for use in armaments, but has been replaced by a stone statue. In Staffelstein, the city of his birth, a number of plaques and stone reliefs have been erected. Perhaps the most spectacular of the monuments to Ries is in Erfurt where a bronze bust, plaque and calculating table keep his memory alive. We illustrate in our pictures of Ries above a stamp which was issued in 1959 to commemorate the 400th anniversary of his birth. Another stamp was issued in 1992 to commemorate the 500th anniversary of his death.